BootsyDoopsy: Romwe 20% discount coupon GIVEAWAY, who want? 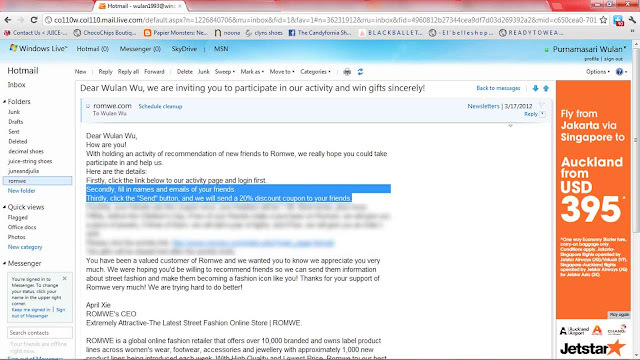 2 days ago, the queen of Latest Street Fashion Online Store, ROMWE sent me an email to ask some friends who want to purchase on their store and give my readers 20% discount coupon. Anyone want this discount coupon? This coupon doesn't force and require you to purchase with them, but who knows you suddenly fall in love with some stuff then this coupon will be very useful. Oh yes, they ship worldwide and FREE! So, what are you waiting for? Go and take a look ROMWE's collection here! Thanks wulan for giving me this coupon..
so i dont know how to use this coupon -_- ughh..